The Mahatma Gandhi University, Nalgonda Conducted Degree I, II and III year Annual Examinations 2017 peacefully. These all Degree annual exams were held in the month of April, this year.The University also completed evaluation process successfully. The University officials declared the Degree annual exams 2017 results on May 30. The results were uploaded by the officials in their official website. 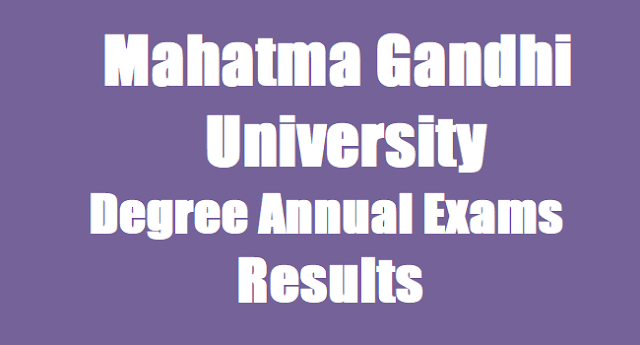 The Mahatma Gandhi University has declared the Degree Second year, Final year Exams Results on May 30. Degree Second year and Final year appeared candidates may apply for the Revaluation and Recounting of their results on or before June 15. Candidates should pay Rs.200/- fee for each one subject for Revaluation and pay fee Rs.150/- for each one subject for Recounting. WEB NOTE: The Results of Degree B.A./B.Com./B.Sc. 1/11/111 Year Annual Examinations held in March/April. 2017. will be released by the Hon'ble Vice-Chancellor Prof. KHAJA AL THAF HUSSAIN. The Candidates can download the Memorandum of Marks from the Mahatma Gandhi University Website i.e.. www.mguniversity.in from 30.05.2017. The last date to apply for Revaluation/Recounting is 15.06.2017. The Fee for Revaluation Rs. 200/- per paper and Recounting is 150/- per paper. The application forms may be downloaded from the University Website."